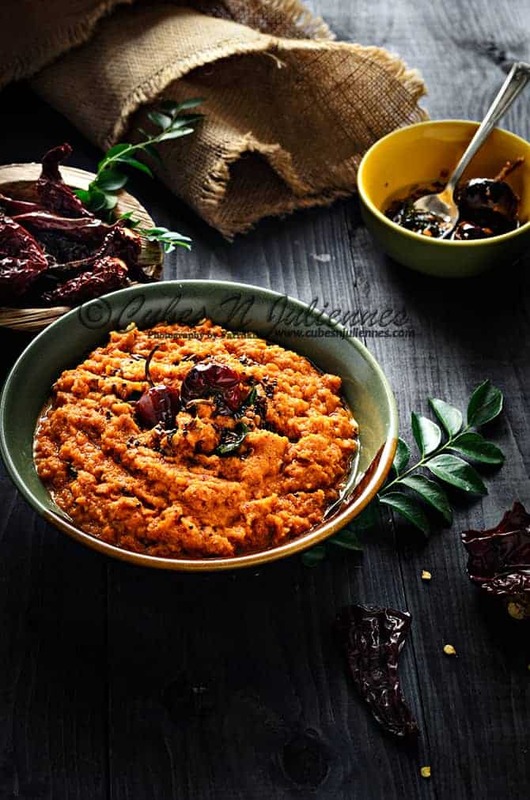 Kerala Style Red Chilli Coconut Chutney is delicious accompaniment made of coconut tempered with coconut oil mustard seeds and curry leaves giving it a quintessential coastal essence to the chutney. The roasted sambar onions ( recommended), garlic and dry roasted red chilies provides a perfect balanced taste and aroma to the chutney. This yummy spicy chutney can be served with any south Indian snacks like, vadai, dosai, idlis, bondas uttapams, uppittu, Rava dosas, puniyaram, or even any pakodas of your choices. This chutney can also be relished as side dish with Khichdi, dal rice, Sambar rice, pongal. Do try it , am sure you will love this chutney to the core…Lets go through how I did it…. In a another small pan, dry roast the red chilies. Farrukh, Can you post one behind the scene pictures of this kinda setup? It will be great to see your take on light. I love chutney, this one goes so well with adai. I love the texture of yours not to pasty. Gorgeous color too. Love it.